I'm so excited to show these off today! I wish I would have made them 3 months ago, I would have been wearing the crap out of them all summer. There's still time for YOU to make your own, and they're easier than you think! And did I mention I made them from 1 yard of fabric?? A lot of culotte patterns are for bias-cut woven fabrics, which sounds like a nightmare to me. 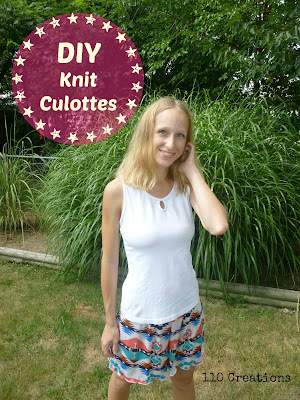 I thought for sure I could find a way to make these from a knit, and using this tutorial from Sewing Like Mad I did it! I urge you to check out the tutorial linked above, but I'll also go over what I did to make my version. 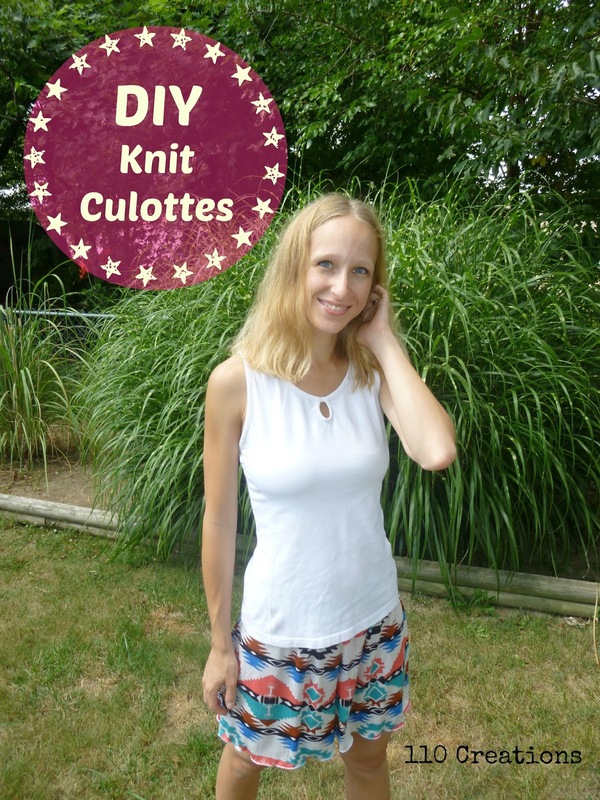 The best part of the shorts is that they are very forgiving, you don't have to be super precise in your pattern-drafting and you'll still have a great pair of culottes when you're done! Start with a VERY basic shorts pattern that fits you well. Ideally it would be a pair of knit shorts or pants with an elastic casing waistband, but I didn't have anything like that. I chose Simplicity 1879, because it has no fly front (only a side zip), and no pockets. There are darts in the back and pleats in the front. Simple. 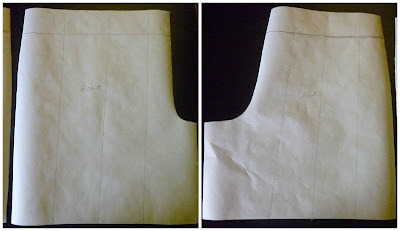 I started by tracing the front and back shorts pieces onto freezer paper, not worrying about the darts or pleats, just going around them with a smooth line. These photos show my original front and back pattern pieces, but with a waistband drawn in along the top. 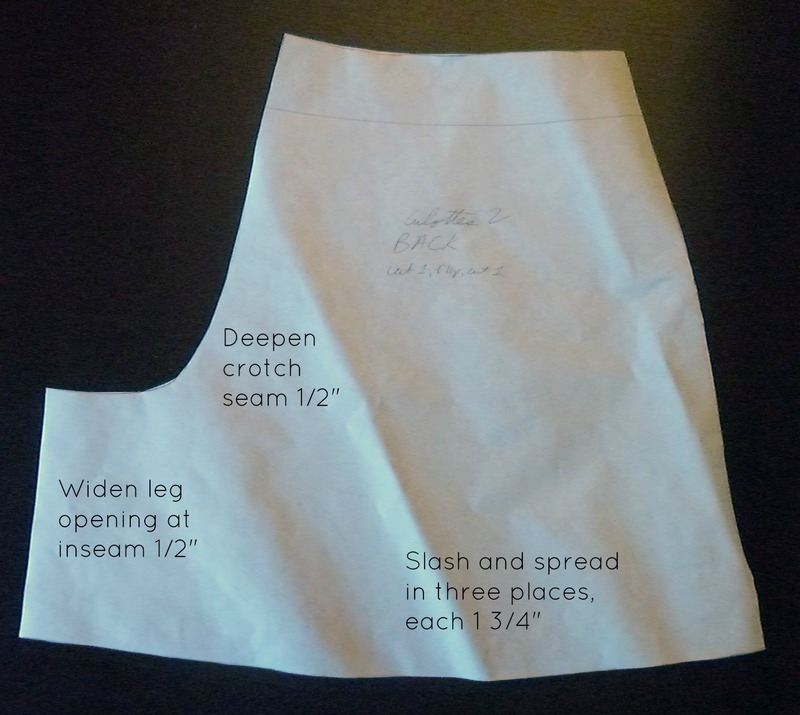 As shown in the tutorial I linked above, you slash and spread the pattern to add fullness. (You can skip over this next bit if you're not interested in my muslin process.) At first, I spread each slash by 1 1/2" (arbitrarily). I did not adjust the crotch depth for my muslin. 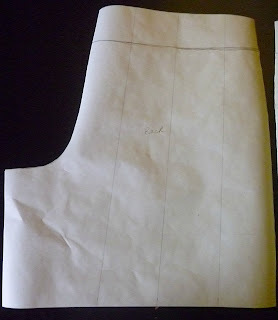 Here is the pattern piece once it has been spread, with more paper taped behind it. It was at this point that I made a muslin. You may recognize the navy blue chevron from this dress. The fabric is close enough to the ethnic knit I used for my "real" culottes, so I knew it would make a sufficient muslin. What I learned from this pair was: 1) I needed more fullness 2) Matching the pattern in the center-front was imperative to make these look like a skirt 3) I needed to do something clever with the hem to maintain a floaty, skirt-like appearance and 4) I needed to adjust the crotch seam to make them look less like shorts and more like a skirt. So, I went back to my pattern piece and did 3 things. First, I added 1/4" to EACH slashed area, front and back (you could probably add even more). Second, I deepened the crotch seams. This was also sort of arbitrary but I dropped it by 1/2" starting at the inseam, then tapered my new curve to nothing at the waistline. My French curve was useful for keeping a smooth line. Lastly, I added 1/2" of width at the inseams, which increased the circumference of the leg opening. I hope this explains the pattern-drafting process! The pictures do a better job than the words, I think. Assemble the shorts the way you would any other pair of elastic waistband pants, trying them on to adjust for a perfect fit. And what about that dainty hem treatment that I mentioned above? Well, I tried something new on my serger! I sucked it up and forced myself to try a rolled hem. Good thing I had already watched that lesson in my Craftsy class. I followed the settings in my serger manual, but the tension was WAY too tight and the machine would barely even feed thread. I was a good little sewist and practiced on scraps until I got the tension correct. On my Brother 1034D, that meant my right needle was at 4, my upper looper was at 4, and my lower looper was at 5.25. The fabric is a rayon spandex knit. My stitch length and width were set to R, and my differential feed was at 1.0. If none of that makes sense, then you're not that different than I was 4 months ago : ) I promise you can learn about serging if you put your mind to it!! There is a very slight lettuce edge waviness, but that actually helps these shorts look more like a skirt. If you don't have a serger, you can always leave the hem raw, because knit fabrics don't fray. Aren't these fun? And SO comfortable. I forget I'm wearing them and don't remember to change into pajamas! All the fun of a skirt with the functionality of shorts! Love it! Is it Thursday again already? I love the Hangout Hoodie pattern I bought from Peek-A-Boo Pattern Shop during last week's Thrifty Thursday. 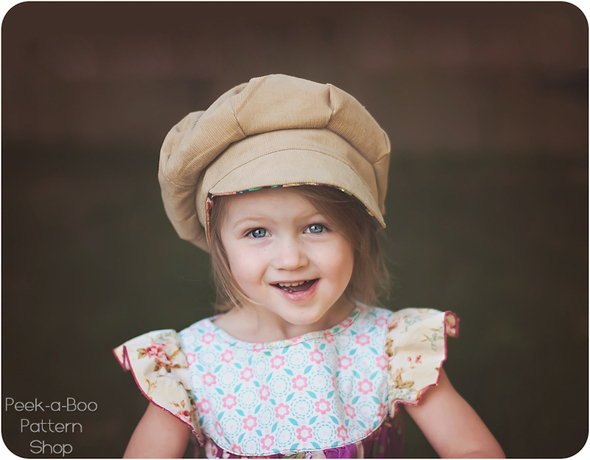 Today's pattern is the Newsie Cap, on sale for just $2.50! If only AB would keep anything on her head...sigh! What a great idea! I've spent this summer in skirts (for comfort) and I think I'll give this a try for next summer. You could easily add some pockets to make them more functional, too. I wore these to the park today withy daughter and they were great for chasing a busy toddler! Great tutorial! I love comfy clothes and this would qualify! Thanks for sharing.